La��attitude 49 , which is part of the Grand Bay Resort, is famous for their fried fish and coconut 49 (elaneer payasam) but their new menu has many winners too. a�?We have removed some dishes like the baked spinach and corn and palak paneer. I have understood the Chennai food palate and I wanted to add something new,a�? says Chindi Varadarajulu, the owner of the restaurant in Mahabalipuram. Having spent most of her life in Singapore and Canada, the strong culinary influences are evident in the restaurant. We started the meal with a well executed Laksa, the popular Malay soupy main course. The gado gado salad, an Indonesian specialty was served next with boiled vegetables topped with egg and mixed with a crunchy peanut salad dressing. The potato wedges are cooked in a sweet garlic sauce served with a garlic chipotle mayonnaise dip that is infused with chilli flakes. The Asian Hot Wings are typically sweet but delicious. a�?All these dishes are new. We want our food to be new and at the same time nutritious,a�? says Varadarajulu. 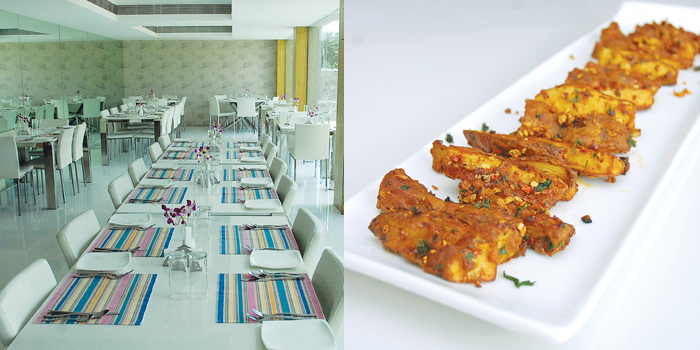 For mains, we dig into Mediterranean Mousakka, where the cheese comes from Mango Hill, a resort in Auroville. a�?These are some dishes that are very popular in Canada and are healthy,a�? adds Varadarajulu. Next, her Canadian favourites are brought in, the vegetarian chilli and the lamb stew, both baked in a bread bowl. The chilli is cooked in a tomato sauce whereas the lamb stew is fragrant with garlic and seasoned with spring onions. a�?I have my own little herb garden with pandan (a traditional Malay spice), three kinds of basil, turmeric, lemon grass, thime and a few fruits and vegetables,a�? Varadarajulu shares. There are additions to her Indian menu as well, like the Badaga avarai curry (kidney beans) a�?we researched quite a bit to get the receipe right. The dish originates from the Badaga community near Nilgiris. When it comes to the Oriental menu, we have added the very popular chop suey and chow mein.a�? she offers. The desserts are simple with sweet caramalised bananas and ice cream, and a cookies and cream offering. A must-try, though, is their carrot cake topped off with cream cheese. They have a special buffet available only on Sundays (`725). As for the resort, it is nearing completion and we cana��t wait.